Poll: Who is your favourite political party leader? Fine Gael remains the most popular party in the country. THE SATISFACTION RATING for the government stands at 47% (-3), according to a Behaviour & Attitudes/Sunday Times opinion poll. The poll also shows that Fine Gael remains the most popular political party in the country, with 33% support (+1), compared to 25% (-2) for Fianna Fáil and 21% (+2) for Sinn Féin. 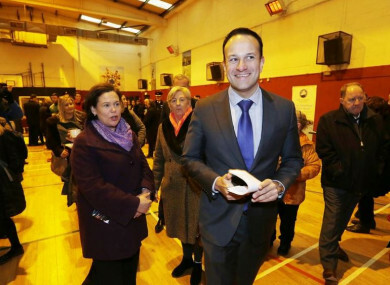 Taoiseach and Fine Gael leader Leo Varadkar is the most popular party leader at 53% (-6), followed by Sinn Féin’s Mary Lou McDonald and Fianna Fáil’s Micheál Martin – who both have 51% support (+5 and -4 respectively since the last poll). Labour’s Brendan Howlin has 45% support (-1). We want to know: Which of these four party leaders do you prefer? Email “Poll: Who is your favourite political party leader? ”. Feedback on “Poll: Who is your favourite political party leader? ”.